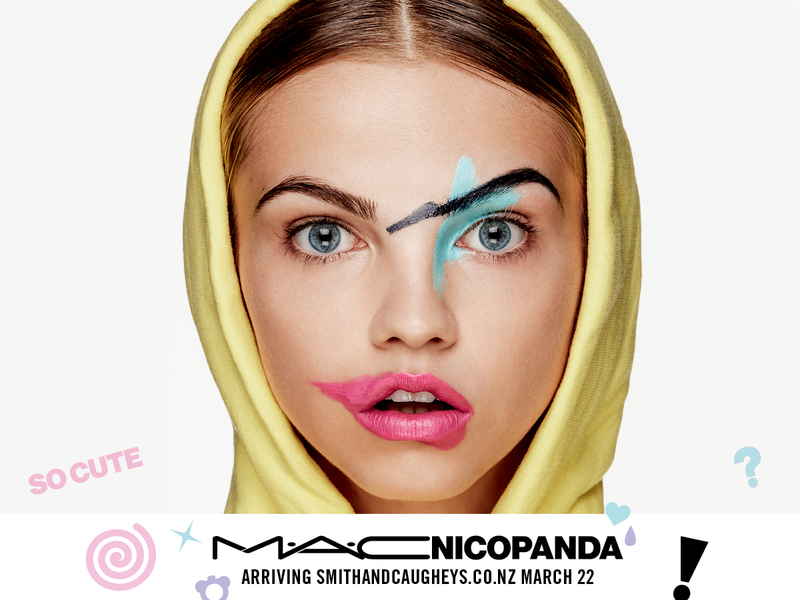 M.A.C Cosmetics in New Zealand has just announced that they are set to launch their full line-up of cosmetics through Smith & Caughey’s online store. Officially launching this Thursday, the online partnership with Smith & Caughey’s will offer the iconic brand’s full range of core products for face, lips, eyes and cheeks as well as brushes and accessories. Select limited edition collections will also be available through this channel. “M.A.C Cosmetics and Smith & Caughey’s have a retail partnership that spans almost two decades. Our first counter in New Zealand was opened with Smith & Caughey’s at their Newmarket location and this is a natural progression of our relationship. We are delighted we can offer beauty lovers more accessibility to M.A.C Cosmetics” says Hayley Williams, Brand General Manager, M.A.C Cosmetics, New Zealand. To celebrate the launch onto smithandcaugheys.co.nz, the brand will be offering beauty lovers the opportunity to pre-purchase products from the collaboration collection with fashion idol and major Gaga collaborator, Nicola Formichetti: M.A.C x Nicopanda. This limited edition collection bridges punk with kawaii-cute funk complete with panda-imprinted eye and cheek palettes and bear-topped lipsticks, lipglass and brushes. It is possibly the brand’s cutest collection yet! The pre-sale will be available from both www.smithandcaugheys.co.nz and Smith & Caughey’s Queen St from March 22nd until stocks last. The collection will then launch in other select doors around the country on April 5th. For those unfamiliar with his name, Formichetti is the creative force behind some of the world’s most influential brands, publications, and pop stars. Nicola has created some of the most memorable and celebrated images of the decade. Italian-Japanese, Formichetti has been at the creative helm of some of the world’s most exciting brands: Mugler, Diesel, and Uniqlo. Most notably and groundbreaking was his work with Lady Gaga as her Fashion Director, where the dynamic duo created her most iconic and talked about fashion looks of recent times. NICOPANDA is Nicola’s most personal creative project. Launched in 2015, the New York based street-brand is best known for its edgy and playful approach to fashion and accessories. Always innovating, NICOPANDA is at the forefront of the fashion world with its hyper-creative philosophy and unique collaborations- true to its creator’s ideology. What was your inspiration for this collection and how did you bring it to life? The inspiration for me was to create something that was new and different and focuses on creativity and diversity all the while being playful and fun. That’s kind of the inspiration for everything I do. I wanted to develop something that was personal to my brand and something that was special to celebrate my longstanding relationship with M.A.C. Together we desired something fresh, new and contemporary for this new generation of makeup users. I’m half Asian and half European, so it was important to me that this collection delivered a little bit of east and a little west. There’s a touch of street culture and high fashion. Ultimately, the panda was a big part of this inspiration. I originally created this character to represent a symbol of creativity and diversity. It was very important to bring the panda into the design and creative process. The packaging is clearly inspired by the panda, which is custom made and the first time M·A·C has launched something like this. It’s visually so exciting, elegant, fun, unisex, and everything we wanted to accomplish. Where do you find your inspirations for your designs? I actually look at everything! Seems very broad, but nature, the everyday, and music often inspire me. I love listening to classical music, Korean K Pop, Rock, and Hip Hop. Music is an emotional thing that can inspire colours, shapes, and designs. I also look a lot at the digital world. Social media is very interesting to me, you get to see what’s going on in Asia, America, Europe, and India it’s incredible. You’re able to be taken through this journey to all of these different places. On addition to Instagram, I look at Tumblr and Pinterest and use these forums to create inspiration boards. Another great inspiration is talking to people like my friends and my family, or even those I’ve never met before. I’m very outgoing and take every opportunity to get inspired by people which I’m able to do through travelling. You have been working with M.A.C for quite some time, backstage at your shows, how did this collaboration come about? I started working as a stylist for M.A.C campaigns about 10 or 15 years ago. I’ve worked so closely with M.A.C ‘s Creative team and I always understood their visions. We would go from a super couture-esque type shoot to a sci fi like shoot, or a renaissance type movie. It was so much fun to be a part of this process. My favourite shoots and those I will never forget were those for M.A.C VIVA GLAM. They were always so glam and in the end, support a great cause so was always an honour to see this come to life. The colours and the packaging are so unique – how did you come up with this concept? The theme was diversity. To create something that was very feminine but also masculine. For the packaging, we wanted this to show polar opposite colours that worked together, just like a panda. With the actual products, I desired to create something that could go from day to night. Something that was fun and funky for the person who wants to take their makeup to the next level, but something that also works for someone who wears minimal makeup. The mix of colours is so couture. In the Full Face Kits, the pink, purple, and dark blues are a little more pop. The lipgloss, eye lashes, and face adornment add a light, fun, playfulness. We also did this gorgeous mint lipstick, Lipstick in Galactic Mint, which completes the collection so well. By mixing all of these colours, we were able to create something that is modern for today. We even created a makeup bag that’s a statement on its own. What are the similarities and differences in creating a makeup collection and a fashion line? The whole process is very similar! I love the diversity of both of our visions and ideas and mixing it all together. The way I designed this collection is very similar to how I create fashion. From sourcing my inspiration to the very end. Like any collaboration, I would first become very close to the brand that I am working with. In this case, M·A·C and I have a beautiful long term relationship so it was an authentic partnership and natural for us to collaborate together. It’s about finding out what each key player is good at and how we can work as a couple to create beautiful things. We are already in this very pleasant place as a pair so putting forth a collection based off of our views of beauty and fashion was so fulfilling. For this collection, we started with the panda itself and built the collection around that. It’s truly about polar opposites; that black and white contrast. How did the name Nicopanda come about? Nicopanda is me - it’s my avatar. I love Japanese cartons so I wanted to create one of my own! The panda grew and became a piece of me that served as a symbol of playfulness and creativity. 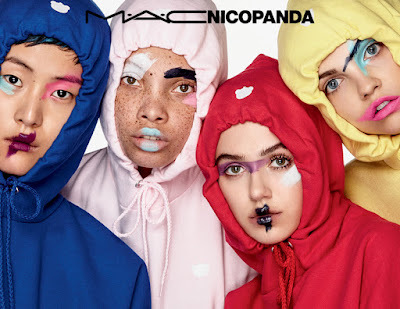 Who is the Nicopanda customer and what do you hope for them to find in this collection with M.A.C? The Nicopanda customer for me is someone who wants to play and isn’t scared of trying new things. I desired to give them the materials to inspire their creativity and encourage that playfulness. My consumers don’t take things too seriously and are super young spirited. Not necessarily in age, but they exude a young energy. This collection is so in sync with that; sophisticated yet light hearted. What is your favourite product in the collection? Does it remind you or is it connected to any of your past designs? It keeps changing! The whole collection is so unique and different and really fits with any mood or occasion. Initially, I was so impressed with the face adornments and now that I finally have these products to play with, the Lipstick in Galactic Mint has exceeded my expectations. It definitely is linked back to my designs because it’s so on par with my vibe. There is this strong Asian influence and there is something so futuristic about the lineup that also feels very today and modern. The models you choose seem to be very unique and diverse. What does diversity and individuality mean to you in beauty and fashion? How significantly the industry has changed? I really hope it is changing and I truly do think it is. People are talking about it so that’s a great move in the right direction – now we have to have more and more people scream and shout about it. The reality is, it’s hard to include everyone in the world when designing products, but we try to send a message to as many as we can when developing both my designs and this collection. Because of social media, we get to see a lot of different things than ever before. There are so many incredible things happening in the fashion industry, it’s great to be a part of this community and to push the envelope in my own ways. It’s not just about creating a product that people will buy but to send a message of inclusivity.